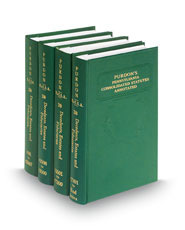 Purdon’s Pennsylvania Statutes and Consolidated Statutes Annotated comprises a comprehensive research tool for anyone desiring instant access to Pennsylvania statutes and constitution. This multivolume set is extensively annotated with legislative history materials that are relevant to specific statute sections. These materials include: enacting and amending laws and committee reports. Thomson Reuters editors invest thousands of hours in every annotated code to ensure that the text, index, and features are accurate and up to date. Comprehensive notes of state and federal judicial decisions provide interpretation and application of the law, expanding your research beyond the statutes. Additional annotative features that point to other relevant law, scholarly works, and crucial material to clarify legislative intent are also provided. These research aids make every volume reliable and easy to use. Detailed general indexes and an exclusive popular name table help you locate statutes with pinpoint accuracy. Experienced attorney-editors curate indexes utilizing a controlled vocabulary, organizing references around legal concepts, and reflecting statutory language faithfully. Indexers make sure to include colloquial and jurisdiction-specific terms. Together with accurate and consistent internal cross-references, you can easily locate the relevant statute without needing to page through the entire set of statutes. This product comes with prompt update services to keep you informed of the most recent changes in the law and the latest judicial interpretations. Cumulative pocket part inserts and supplementary pamphlets are shipped annually, keeping the volumes up to date. An interim update pamphlet is published annually to supplement the annual pocket parts. Recompiled editions are typically shipped four to six times a year, with approximately 11 volumes shipped annually.